Freedom Plastics Inc., of Janesville, Wis., is an experienced manufacturer and fabricator of thermoplastic products. The company extrudes PVC and polyethylene pipe products, and fabricates PVC pipe fittings and various other products for the water, irrigation, plumbing and industrial markets. 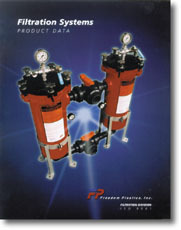 The company also manufactures filtration systems as described in its brochure and has designed and engineered filtration products under real-world conditions in its own plants.